What a roller coaster ride last year has been. From giving up corporate job, being a new mommy, a few medical hiccups, seeing my little sister get married and a lot of travel thrown in, I have barely had a chance to catch a breath. Inevitably, the blogging has suffered. But now that I'm back and finding a new regular routine, I feel more inspired than ever. The long stay in India this year also allowed me to have a lot of time to cook with mom and dig into our ancestral stash of all things vintage. I nearly paid an arm and leg for the weight I carried back. Hopefully, the inspiration will translate into more posts if my idea of putting Tasnim in the walker and shooting ever really works out. And if she could stop hitting my setup every single time. As for this recipe, it has been on rotation in my family since last summer. I used to make a slightly different version of it before which was good, but this, this is marvelous. The best chicken tikka in my opinion. Good quality spices are a key where most of the marinate is about spices. 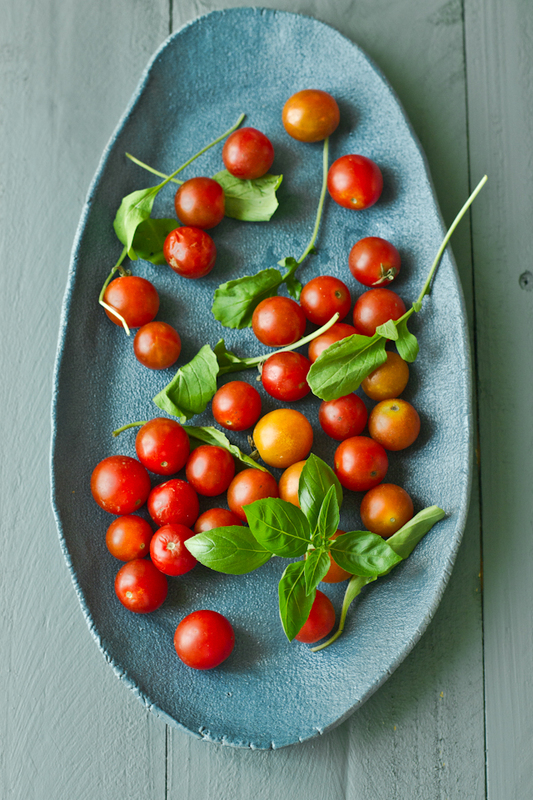 The side of cherry tomatoes, arugula and onions provide a fresh contrast to the succulent and spicy tikkas. Served with mint raita to clear the palate as you move on to the next one. Cut the chicken breast into bite size cubes. Marinate the chicken in ginger garlic and chilli paste overnight. Add rest of the ingredients and marinate it for another hour. Brush the grill or cast iron pan with ghee, and cook the chicken on both sides until juices run clear (about 2 -3 minutes on each side). Blend half the yogurt with mint leaves in a blender. Whisk in rest of the ingredients. Toss together the leaves, tomatoes and onions. Sprinkle with lemon juice, cumin powder, salt and pepper. A fabulous and summery dish! 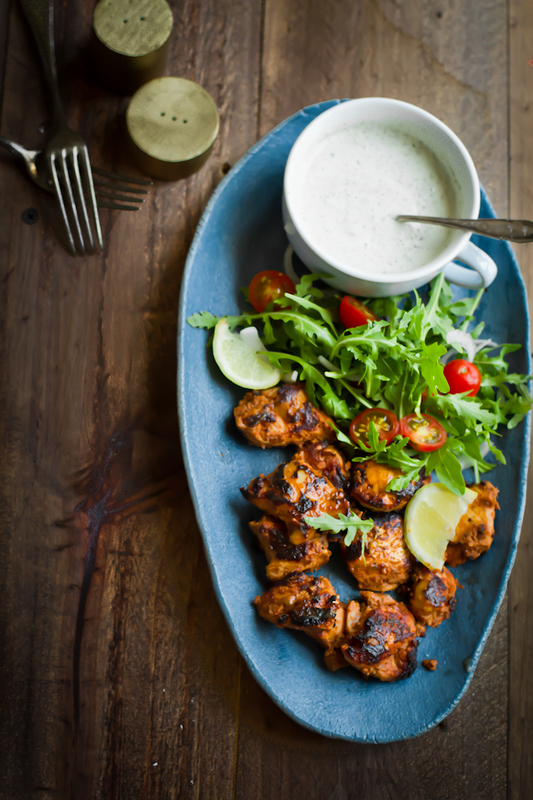 Chicken tikka is perfect when served together with this mouthwatering salad. 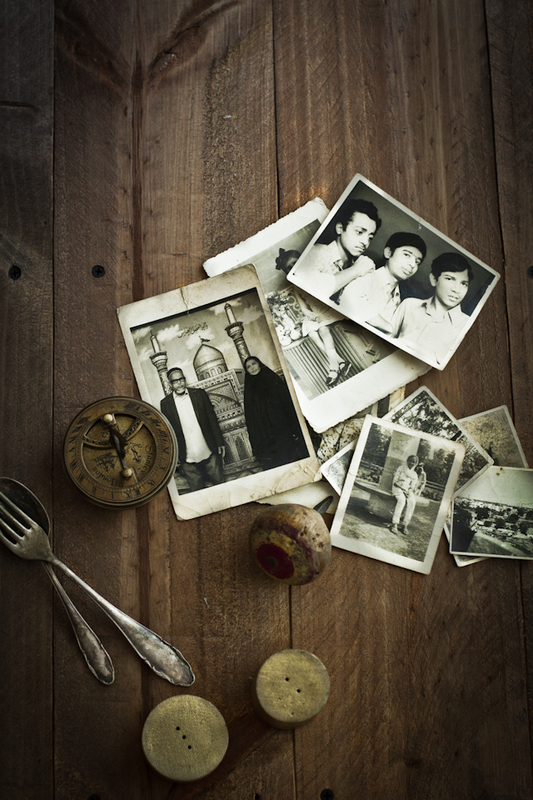 gorgeous shots and lovely family pictures! Absolutely love clicks and equally great recipe. Great to see that you are back! Sounds like you had a wonderful trip and have some gorgeous photos to share! Love, love, love! So much of hard work and creativity has gone into this post. :) I really admire the way you have used each and every prop. Wonderfully thought. Welcome back! Happy to see a new post from you. While it's not easy to get work done with babies around, I felt like I have been most productive after I have had my daughter. Now with the second one on the way I don't really know how things will change. Your prop collection looks incredible! I am sure it's in right hands :) Can't wait to see more gorgeous photography from you. Great to see you back, happy blogging.. I too am a Bohra and have just discovered your blog. Look forward to seeing more of you recipes. Lovely recipe - this would make a perfect light supper dish in the hot weather. 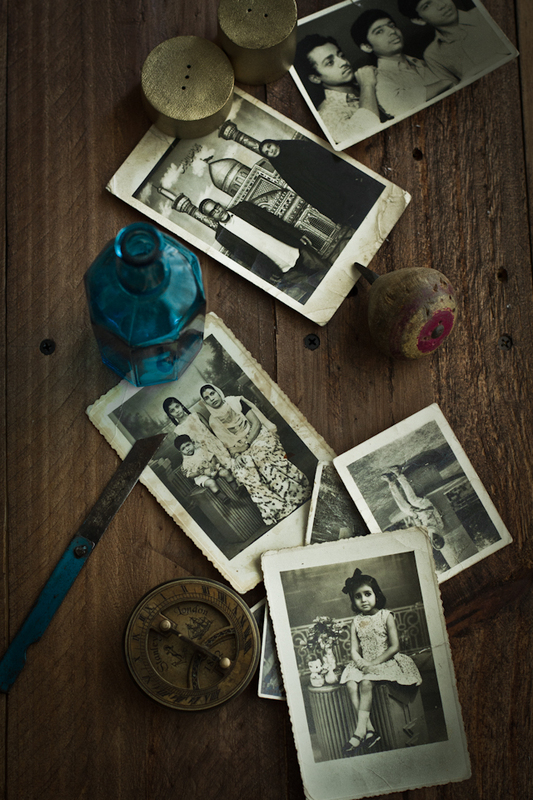 Great to see the family photos - how nice for you to have! so glad to see you back. I will be trying this recipe tonight. thanks for sharing. So glad to have you back, and hopefully well. And thank you for this simple but obviously very delicious recipe (how can it not be!). Bookmarking for when I buy some chicken - I have everything else, including Kashmiri chillies. I take it that with the very brief cook time that the chicken breasts are boneless? Oh, the pictures, the food and your write up was perfect. Lovely to see you back Kulsum. 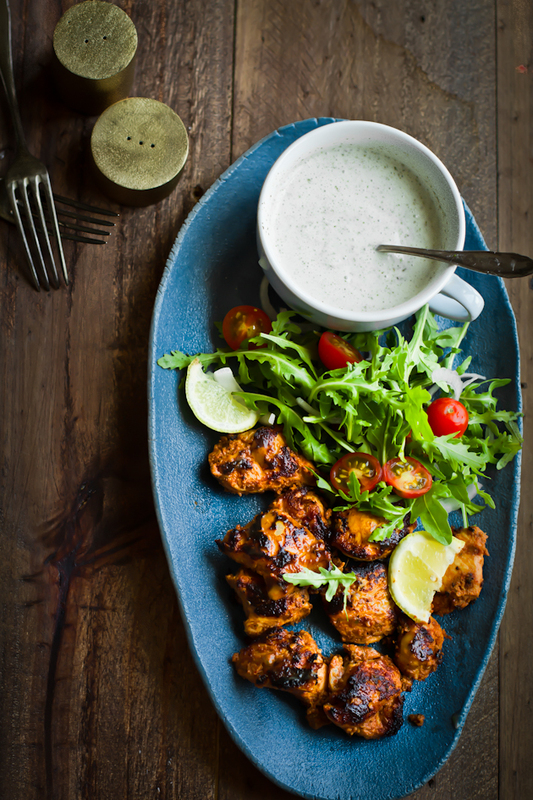 Sounds like you've been having a wonderful time, and this chicken tikka is just gorgeous. I make chicken tikka almost the same way except that I never added besan, sounds perfect thing to make for summer bbq get togethers out here. The tikkas sound awesome and those ancestral vintage props look amazing! That plate is appealing to even this vegetarian!! 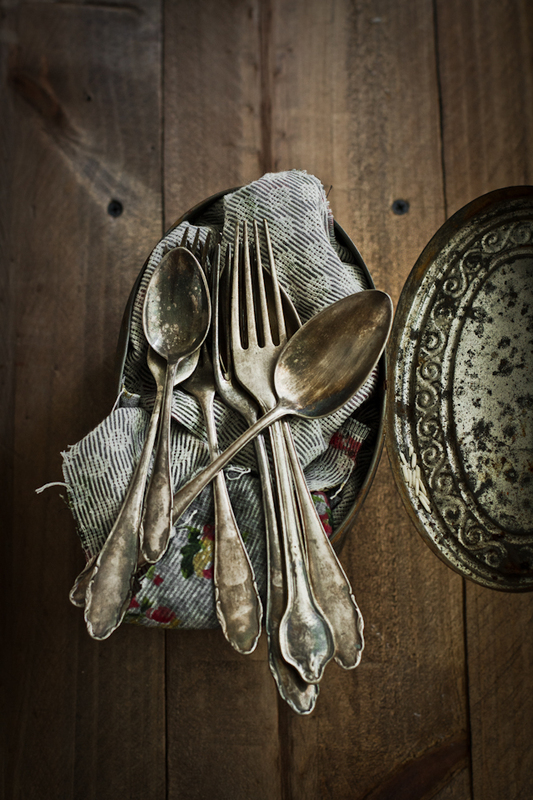 Love the other shots of vintage family finds.. Stunning pictures! And I love the recipe for chicken tikka, one of my favorite Indian food.